Gear and ability manager with full drag and drop support. - Have no active functions in idle. - Trusty. You will not find yourself in the battle with the wrong skills on your swap panel. - Full drag and drop support. You can use the mouse to set skills from the skills window, from the ability bar, clothes from the inventory or the character’s window, you can move, rearrange and copy everything in the manager’s window. There are also context menus for complex copying/cleaning of slots. - Intuitive mouse control with all kinds of highlights and control of user actions. 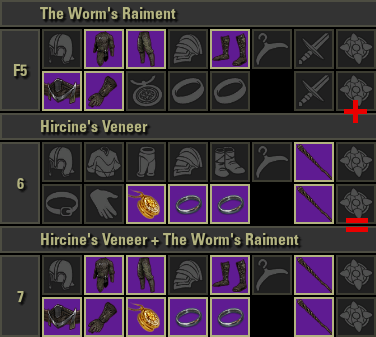 When placing an item or skill will automatically highlight the appropriate slots. The manager will not allow to put two identical skills on the panel, to put the jewelry on the belt slot or inserting ability into the slot of the ultimate. For all items and skills there are in-game tooltips. - Items that are equipped or not available for equipment are marked with altered slot frames. - Interactive headers with automatically generated names based on exposed item sets. - Interface now closes on ESC, combat, etc. Additional panel hotkey now works as switcher between additional and active gear panels. I gotta say, I really like your addons. Add quickslots to the gear profile. AlphaGear doesnt support Quickslots either - There is "Static's Quickslot Profiles" though. 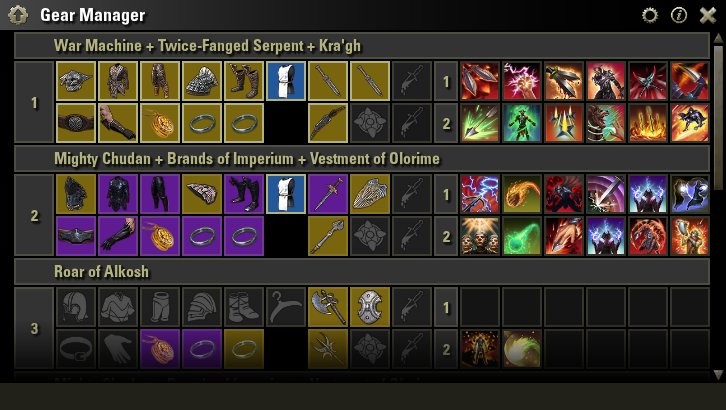 Another idea is to add Profiles similar to AG or the region based tabs like Dressing room. Many ppl have way over 12 setups. The unequip function has an issue known from similar addons: It will unequip either no weapon, or just from one bar. With dual wield/s+b another click might just unequp 1 of those 2 again. Sometimes there are users in the comments, where I gotta shake my head. But sometimes you seem just completely beyond stubborn. Add the option to custom name the header. While very useful in many situations, it is also helpful to be able to name your sets "harvesting", "pvp" etc. How are users supposed to seperate similar setups ?? In PVE: Tanks might have Torugs + Alkosh in easily over 10 setups, just as many different alkosh jewel trait and enchant combinations. Same for Healer. For DDs its mostly weapon trait and jewel trait. Could although be whether it is WM frontbar or on body. That point alone will keep many endgame players stay with Dressing room or AG. Last edited by wambo : 04/08/19 at 03:07 PM. Hello, i got a warming message form the game with switching bar from 1 or 2 to additional, that i am sending messages to quickly, is there a way to fix it ? Ok, tried it and loved it! The only thing it is lacking is the ability to edit or name the sets myself. Thanks for this addon it's awesome! Very good one Hoft, I really like it. The only thing I'll add is the capability to give a name to the set combination. It is not useless as you commented before, especially if you've a toon with multiple setup on pve/pvp etc..
I.e my stamblade has a pvp melee setup, pvp ranged, pve 2w+bow, pve 2H+2w, a completely different arena setup, etc..
For that is the numeration. I think is useless, just my opinion. but after restarting the game, how come my skills won't get changed anymore? Skills can not be changed when you are in combat. May be you get "bg bug". Try to kill any mob/critter. what's BG bug? i do play BG alot... next time it happens ill try to kill something. but yeah, seems to work fine now. the capability to give a name to the set combination. I can't figure out how to get the ui to show up. Addon works very well once i figured out what is what. but after restarting the game, how come my skills won't get changed anymore? neither would the additional bar or that temporary skill thing. last night it worked very well. tonight, only the gear is swapped, but nothing with the skills worked? 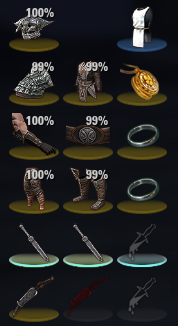 I've installed both bandits ui and this gear manager and have no idea how to make it show up. I've read the description and haven't found any details. Can anyone lend some advice? Не встречал потребности в подобных действиях. Возьму на заметку. когда новая конфигурацию записать поверх старой, и в новой будут пустые слоты, то в этих слотах останется оружие из старой конфигурации. Это принцип объединения различных подборок. Есть в описании адд-она со скринами и пояснением. По поводу переименования заголовков: Уже неоднократно отвечал что считаю это бесполезной мутью излишне нагружающей интерфейс и потому делать не намерен. How do we add a collectible costume to the gear setup? I feel like I am overlooking something. The only way I have been able to do this is by adding the current setup to a gear set but can not drag and drop from the collectibles portion of my UI to the gear manager. Yes. Only using "Insert current". ZoS collectibles does not supported drag and drop. 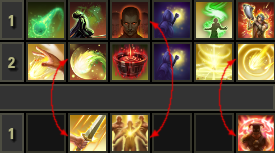 Is there a way to save a profile or require a confirmation before making a change so I dont accidentally remove an item by right clicking and forget what was there? Checkbox with each set to preserve "Empty Spaces". This should allow one set to overwrite the other, regardless of unfilled slots. 4. Helm Hide option per gear set. 5. 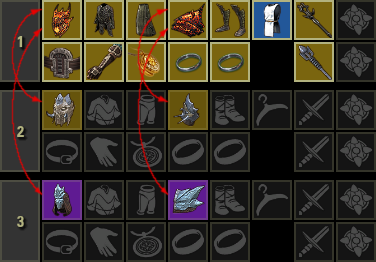 Option to remove any applied collectible costume so only the gear shows. Useless on my opinion. Easy to do this manually. Last edited by Hoft : 01/27/19 at 09:21 AM. PS Пишу каждую багу отдельным комментом для удобства. Убираем через панель экипировки щиты, в аддоне жмем Insert current для сохранения второй конфигурации поверх старой - ничего не происходит. Если сохранить в новую третью конфигурацию, то все ок.